While Norman Rockwell’s Man Charting War Maneuvers might not contain the jaunty expressions of Willie Gillis: Food Package or the innocence and joy of Marble Champion, the scene is relatable to concerned households across the United States. Front and center, a man listens intently to the radio with a cigar in hand and with his cats close by. It may seem innocuous at first, but after examination of the photos of the young men on his wall beside the faces of two of America’s military leaders in Dwight Eisenhower and Douglas MacArthur, it quickly becomes apparent that this man is listening for updates as to the location of his sons. He has thoroughly traced the movements of allied battalions in Italy in the map on his lap and he closely monitors American positions in England and Northern Africa. This scene is emblematic of the home front during war time. Similar to countless other Rockwell works, it had the ability to connect to homes across the country, given the sheer size of America’s armed forces. 10 million men went off to fight during World War II out of a population of 120 million. Everyone knew someone off at war, be it a father, son, brother, friend, or husband. The only connection that those at home had with the men they knew was via radio broadcasts made three times a day in the newspaper or pre-movie newsreels at local theaters. This cover illustration exemplifies Rockwell’s distinct ability to connect complex and solemn themes to homes across America. Through analysis of his work, one observes that Rockwell’s art changed with the times that he lived in. He started out as an illustrator during the 1910s and lived through the Roaring 20s and all that that time brought to America. However, as the Depression began in the 1930s, his art took a turn towards very nostalgic, innocent subjects. These subjects are ultimately representative of the changes America went through during his lifetime. America was very isolationist during the Depression and the country was protected from the dangers of Adolf Hitler and Imperial Japan. That soon changed, and as war broke out in 1941, America’s sons were sent overseas. Worried parents and relatives, like the man in Man Charting War Maneuvers, were left to sit at home and merely hope and pray that their relatives were safe. This was a profound change in the fabric of American life, as the war was brought to the home front by radio and by newspaper. These sources informed the American public of the horror, terror, and fear that their friends and family were facing across the globe. 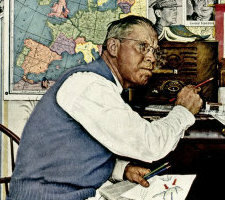 Norman Rockwell’s Man Charting War Maneuvers is an example of Rockwell at his finest. Rockwell’s signature style is exemplified by more joyous tones. He used bright colors, laughable expressions, and depicted events that weren’t necessarily tied to the overhanging danger of Nazi Germany or the Great Depression, both of which affected all corners and sectors of the population. Rockwell’s chosen subjects were not tied to those dangers, but rather tied to what he saw as some of the most basic and fundamental aspects of American life. His works were based on something that a wide readership and viewership could all relate to. He manages to depict the solemn activity of anxiously awaiting news of the status of children of at war in a way that all Americans could understand. His work always tried to convey a sense of relatability and connection. 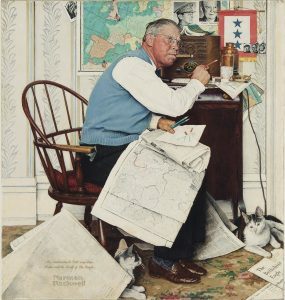 Through focusing on these fundamental things that millions of Americans knew, like playing marbles or listening to the radio, Rockwell kept morale up and reminded the American public what they were fighting for. In January 1941, President Franklin D. Roosevelt gave his annual address to Congress in what is now known as the “Lend-Lease Speech.” The purpose of that speech was to support giving American allies in Europe money and equipment to aid in their fight against Adolf Hitler. However, late into the writing process, President Roosevelt added a paragraph articulating his ideals for the postwar world. This world was built upon four freedoms: freedom of speech, freedom of worship, freedom from want, and freedom from fear. These were to apply not only to the US but also the world as a whole. When the US entered the war, it was these freedoms for which America was fighting. Unfortunately, American soldiers and their families would have to wait to achieve these freedoms for themselves. American soldiers, sailors, airmen, and marines and their families would have to be afraid and be denied freedom from fear. Freedom from fear may have been one of the postwar foundations that FDR sought, but even attempting to preserve this freedom for the world comes with a high cost and sacrifice by millions of people. When Americans landed at Omaha Beach or made their way into Berlin, American soldiers and their families were afraid of the dangers that they knew lay ahead of them. They were not granted the freedom from fear that FDR had sought in his speech. Norman Rockwell displays this fear well in Man Charting War Maneuvers. The man listens carefully, knowing that each update could carry triumphant news of allied success or the realization that one of his children has been killed in action. Roosevelt was able to set out the goals of the four freedoms in 1941, knowing that America’s strong fighting force stood ready to fight for them on his behalf and despite the sacrifice that would need to be made by American soldiers and their families. George Orwell wrote that “those who abjure violence can only do so because others are committing violence on their behalf.” It may not matter whether or not Roosevelt realized this problem behind the four freedoms, and freedom from fear in particular, but freedom from fear was something that many American families did not have because they were fighting to secure that freedom for others. Roosevelt was able to make the speech promising these freedoms because American soldiers stood ready to commit violence on his behalf. Cox, Mary-Lea. “Freedom from Fear.” Carnegie Council for Ethics in International Affairs. Last modified September 28, 2005. Accessed July 25, 2018. https://www.carnegiecouncil.org/education/001/four_freedoms/5227. “FDR and the Four Freedoms Speech.” FDR Presidential Library and Museum. Accessed July 25, 2018. https://fdrlibrary.org/four-freedoms. Hanyok, Robert J. “Secrets of Victory: The Office of Censorship and The American Press and Radio in World War II.” Central Intelligence Agency. Last modified June 27, 2008. Accessed July 25, 2018. https://www.cia.gov/library/center-for-the-study-of-intelligence/csi-publications/csi-studies/studies/vol46no3/article10.html. PBS. “Communication.” PBS. Last modified September 2007. Accessed July 25, 2018. http://www.pbs.org/thewar/at_home_communication_news_censorship.htm. “Research Starters: The Draft and World War II.” National World War II Museum New Orleans. Accessed July 25, 2018. https://www.nationalww2museum.org/students-teachers/student-resources/research-starters/draft-and-wwii. Robinson, Bruce. “World War Two: Summary Outline of Key Events.” BBC. Last modified March 30, 2011. Accessed July 25, 2018. http://www.bbc.co.uk/history/worldwars/wwtwo/ww2_summary_01.shtml. Rockwell, Abigail. “Norman Rockwell and The Post: A Fruitful Relationship.” Saturday Evening Post. Last modified May/June 2016. Accessed July 25, 2018. http://www.saturdayeveningpost.com/2016/05/18/art-entertainment/norman-rockwell-art-entertainment/a-fruitful-relationship.html. Scales, Joseph. “Tuning in to World War Two.” Saturday Evening Post. Last modified September/October 2018. Accessed July 25, 2018. http://www.saturdayeveningpost.com/2014/09/24/art-entertainment/norman-rockwell-art-entertainment/the-rockwell-files-tuning-in-to-wwii.html. We are the governed, but we govern too. Assume our love of country, for it is only the simplest of self-love. Worry little about our strength, for we have our history to show for it.